Understand where the biggest gains in CX are! Close the gaps between desired end state of CX and current realities. Start fixing the “leaky funnel” issues occurring due to underperforming CX. The Value Gap: cars carry significant value for most people, so customers expect their buying or servicing experience to match that value. Many automotive HQs have realised this, understanding the ROI of great CX. But dealerships, often operating with 1-2% margin only, don’t necessarily see how extra work for their people translates into more money for them. The Management Gap: customers perceive the whole chain of “HQs - National organization - Dealer” as one company, expecting a single point of view on their car’s affairs. But reality is different. In order to assure smooth, aligned CX, the HQs establishes standards and KPIs for the whole chain, which dealers may not feel motivating or relevant. In their turn, dealerships are often reluctant to share their customers’ data, stopping the “single view” from happening. The People Gap: new times require new skills. Customers want to be listened to and be understood, they seek offers reflecting their needs, and service that’s personal. While both HQs and national organization get that, dealers will struggle: after all, they know how to sell and service a car, but not necessarily how to be proactive and entertaining but non-pushy. 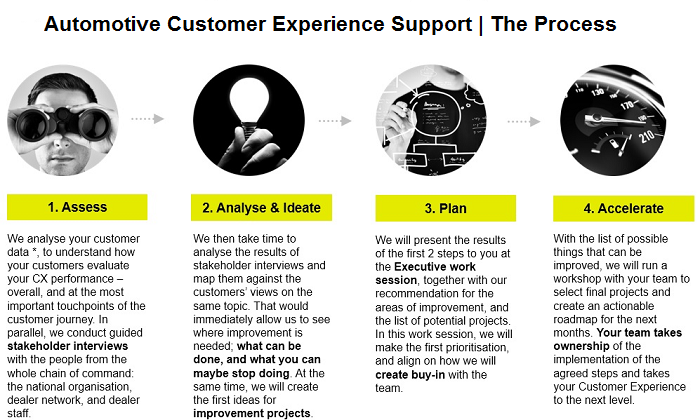 enables you to measure the progress of profitable, sustainable customer experience in your business. You will find out which activities are bringing you closer to customers and which are still in your way. Our experts will compare you with the best in the industry, identify gaps in your capability and show you how to boost growth while delivering great CX… profitably. is designed in order to fix these gaps, answering the specific needs of a National car sales organisation. In just 6 weeks, we will run a scan of your value chain, in order to help you! Interested? Inspired? Curious? Questions? Let’s have a coffee and talk!